It is that time of year again when life starts to get a little hectic and busy, but there are many opportunities for our children to write. We try and make sure that Elly spends at least 20 minutes a day writing. Some days I provide prompts or ask her to help write lists and letters, but she mostly figures out what to write on her own. I have to admit, that I printed my writing rubrics and started focusing on word choice and conventions, but haven’t finished our book that we have been working on and didn’t officially use the rubrics like I wrote about in this post. My goal is to take a writing sample of Elly’s each month and save it in a file, using the rubrics to guide my scoring and future instruction. In reality, I am just snapping pictures of my favorite writing and including them with my pictures for my family blog. Every year I print out a book of that blog, so at least the writing samples will be on record somewhere! There are some absolutely adorable holiday writing prompts and crafts on the web right now! 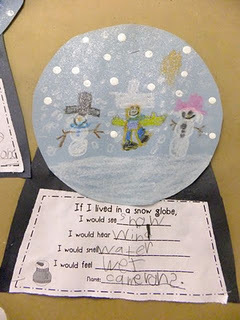 If you haven’t stopped by First Grade Blue Sky’s yet, she has some great ideas for grade school age children. These are two of my favorite seasonal writing crafts and prompts of hers. She sells the templates for the elf here. 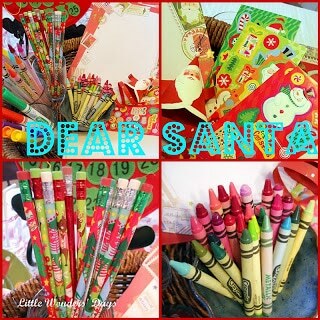 Little Wonder Days is SUPER organized with the cutest writing supplies and orchestrated a Santa writing party to use them – what an amazing ideas! A basket with adorable pencils and bright colored stickers make ME want to spend an afternoon writing!!! Superheroes and Princess loved this idea too – here is her spin on it! One of our favorite things to do is to use the fronts of old Christmas Cards as a writing prompt. This is my 5 year olds writing sample from yesterday. It says (in grown up spelling) “When the prince marries Snow Write, the Dwarfs are happy to see that Snow White was in love. The prince brings Snow White to his castle.” We have a huge stack of cards just waiting to be written about. When she competed this page she asked if she could write another. “Maybe tomorrow.” I answered as if this activity was in limited supply. =) I am hoping to keep the motivation for this activity so that there are many more Christmas Card free writing days in our upcoming week! Last, but not least, I just adore these baby doll headbands over at Mama Smiles that her daughter made! Giving a purpose to writing or changing the way you use or display writing can be highly motivating. My 5 year old would think this is really neat. I am going to suggest her to make some December Holiday themed ones this week. What have you been up to? We’d love to have you join us in sharing your writing, reading, and other activities that you are doing with your grade school children. I love your idea of using old Christmas cards as writing prompts!